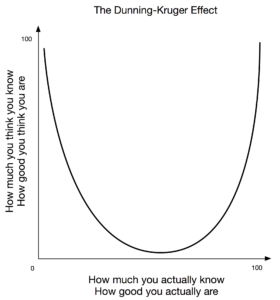 The Dunning-Kruger Effect demonstrates that the less you know the more you think you know. Low performers think they are high performers. High performers think they are high performers. Only medium performers think they are worse than they actually are. Consequently, if I were to walk into a room of people and ask for volunteers to help me solve a problem in an esoteric field of study, such as partial differential equations, I would likely be better helped by asking a person who did not volunteer! This quirky reality underscores the need for objective assessment, and it is true for individuals as well as organizations. To avoid the pitfall of the Dunning-Kruger effect in your assessments, seek help from an outsider who is, by definition, not self-assessing your software organization’s performance. Until recently there were no objective statistics available for software organization performance, but now the industry benchmarks and scientific evidence-based models are available—I know, I have been using them with clients. Companies ignore these objective data at their own peril. Contact me for hep evaluating your organization’s performance. Make the cloud work for you. My respect & admiration for Shlomo Swidler continues to grow. He’s the ultimate cloud expert, business coach, and a true mensch. Do you have what it takes to build and run your own private cloud? Copyright © 2009-2016 Shlomo Swidler. All rights reserved.